JBS is the world's largest producer of beef, and this week its Brazilian headquarters has been embroiled in a food safety and bribery investigation. It started on March 17 with raids on meatpacking plants in Brazil, one of the world’s largest exporters of beef. Federal police carried out the sting, which left two of the country’s biggest beef companies standing accused of egregious food safety violations. The operation – which used the evocative code name Weak Flesh – uncovered an alleged bribery scheme among several beef companies, including giants JBS SA and BRF, and government health inspectors, who allowed the companies to ship out beef past its sell-by date. The investigators also allege some of the companies were repackaging spoiled or contaminated meat, using additives to mask smells, and passing beef off as inspected, safe-to-eat meat. The Brazilian company JBS, which calls Greeley, Colorado, its North American home, has acknowledged the bribery, telling Bloomberg that the offending employees are being reprimanded. Because Brazil is a behemoth in the global beef trade, the reaction to the news has been swift. China quickly halted beef shipments from Brazil, leaving some container ships full of frozen beef stranded offshore. Officials with the European Union have asked Brazil to cease beef shipments to its member states. JBS has decided to temporarily shutdown 33 of its beef facilities in Brazil in response to the international embargoes. An investment law firm has filed a class action lawsuit against JBS. In the U.S., federal regulators are assuring meat eaters that the beef supply is safe. In a statement this week, the U.S. Department of Agriculture’s acting deputy director Mike Young made clear that the agency is taking precautions. Safeguards include more testing for pathogens of raw beef shipped from Brazil to the U.S. and stepped up inspections at all ports of entry. No beef from the facilities implicated in the investigation was shipped to the U.S., according to the USDA. The beef trade between the U.S. and Brazil is a relatively new, and is a somewhat fragile relationship. After years of talks and negotiations, the U.S. reopened trade with the South American country in August 2016. Between 2003 and 2016 no Brazilian beef made it to American shores. As the USDA was finalizing the trade deal, U.S. ranchers cried foul, claiming the Brazilian government wasn’t doing enough to tamp down outbreaks of foot and mouth disease. The Brazilian probe has American lawmakers skittish. After news of the investigation broke, Montana Democratic Sen. Jon Tester introduced legislation to ban import of Brazilian beef for 120 days. "We must take decisive action to ensure no family in Montana or anywhere else in this country is exposed to the danger of deceptive Brazilian beef processors," Tester said in a statement. JBS is the world’s largest producer of beef and has been on a spending spree for the last two decades, buying up American meat companies like Swift and Pilgrim’s Pride, as well as portions of Cargill’s meat operations. The company announced it was restructuring late last year, in order to plan for a 2017 public offering of its American assets. It is unclear how the current controversy could imperil that decision. “We fully support the positions of the North American Meat Institute and Secretary of Agriculture nominee, Sonny Perdue, who have both stated that the U.S. should not ban Brazilian beef imports,” said JBS USA spokeswoman Misty Barnes. Correction: A previous version of this post suggested JBS was among the companies alleged to have been repackaging spoiled or contaminated meat. Not all of the companies under investigation are alleged to have engaged in this practice. When I dig into a burger, I might think about how the cow the beef came from was raised -- whether it was grass or grain fed, locally raised or imported -- but rarely do I consider what breed of cow the meat came from. If I did, I'd guess that it was beef from a Black Angus, Hereford or Charolais cow, which are the three most popular breeds used for meat production in the U.S. But that notion got turned on its head at this year’s Missouri Cattlemen’s Association’s convention in Columbia, Mo. When the dangerous organism known as Shiga toxin-producing E. coli gets into the food system, it can be deadly. That’s why more than 50 researchers at 18 different institutions are hoping to find ways to identify and wipe-out the strain in beef, as part of a major USDA-sponsored study. The $25 million project began in 2012 and was recently extended for at least another year. 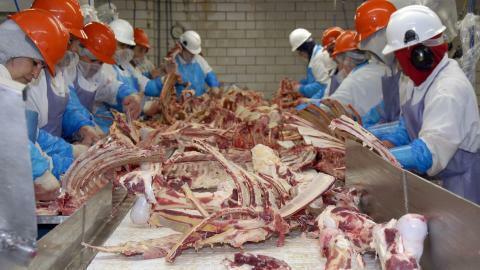 A slaughterhouse is a safer place to work than it used to be, but data gathered by federal regulators doesn’t capture all the risks faced by meat and poultry workers, according to a new government report.